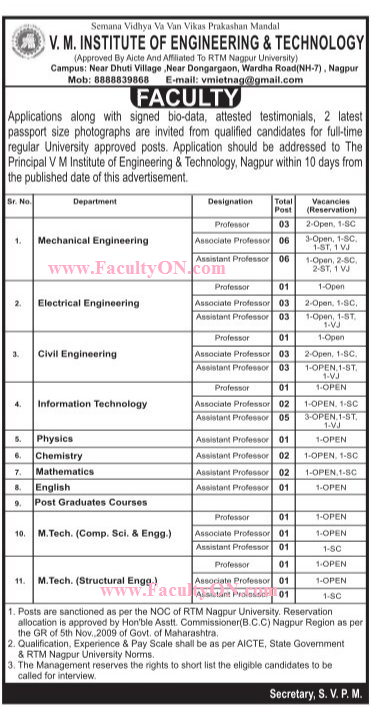 V.M Institute of Engineering and Technology, Nagpur has advertised in the LOKSATTA newspaper for recruitment of Professor / Associate Professor / Assistant Professor jobs vacancies. Interested and eligible job aspirants are requested to apply within 10 days from 12th April 2018. Check out further more details below. About College: The (VMIT) V.M Institute of Engineering and Technology is situated on a congenial atmosphere encompassing a panoramic lake side view on Nagpur Hyderabad Highway in its own state of art campus owned by the trust. The campus offers a fusion of environment, resource and support to maximize the potential of students. Aesthetically built campus comprises state of buildings with wi-fi enabled facilities. How to Apply: Interested candidates are requested to send CV along with attestedcopies of certificates and 02 recent PP size photo to the postal address provided below.